A week after Hurricane Florence finally moved out of North Carolina, a small group of researchers moved into areas that were still reeling from the devastation. They were engineers, and their goal was to see how the wind, rain and flooding had affected the earth underlying the affected area. 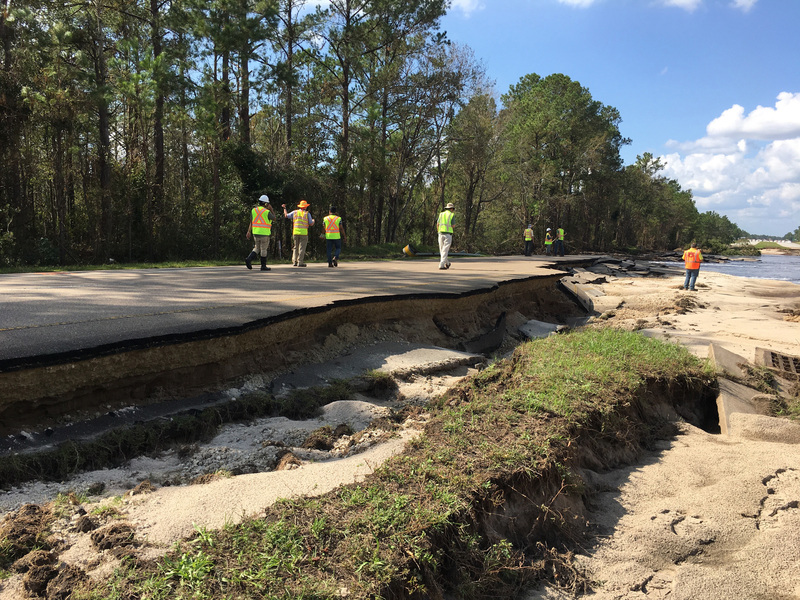 GEER experts, including NC State grad students Long Vo and Md (Ahsan) Ahsanuzzaman, assess a washed out roadway after Hurricane Florence. Click to enlarge. Montoya was part of a Geotechnical Extreme Events Reconnaissance (GEER) team, funded by the National Science Foundation. 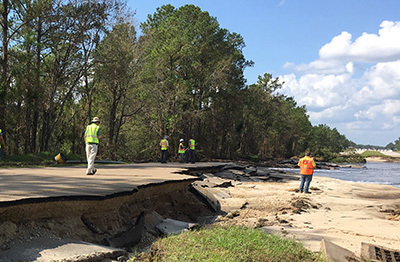 GEER teams are made up of geotechnical experts from around the country who arrive at the scene of disasters to gather data on the effect that these extreme events – from hurricanes to earthquakes – have on the infrastructure and underlying geology of the affected region. To do this, GEER tries to bring in researchers as soon as possible after an event, without interfering with emergency response efforts. One challenge with Florence was that flooding continued in the hardest-hit regions long after the hurricane itself had passed on. The post-Florence GEER team was led by Lee Wooten, a geotechnical expert with GEI Consulting, but included researchers from the University of Illinois, Auburn, Clemson, Louisiana State University, North Carolina Department of Transportation (NCDOT), and the Federal Emergency Management Agency, in addition to NC State. From Sept. 24-27, Montoya and four of her graduate students – Jinung Do, Long Vo, Md Ahsanuzzaman, and Rowshon Jadid – collected data at sites ranging from Goldsboro to Wilmington, all in the Neuse and Cape Fear river basins. Some of their findings were promising, others frustrating. “We worked closely with NCDOT to compare conditions before and after Florence,” Montoya says. “One of the things we took away is that conditions at places like bridge pilings fared better after Florence than they had after Hurricane Matthew. 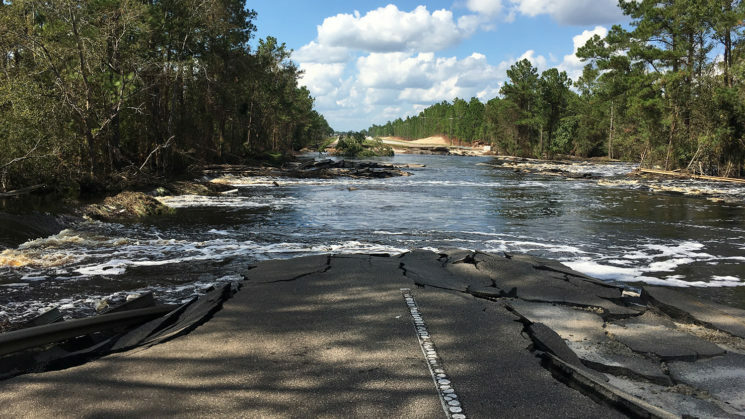 NCDOT saw what had been problematic after Matthew and took steps to account for hurricane risks – and those precautions appear to have paid off. At most of the sites where Montoya’s team found problems, the proper authorities had already identified the sites as targets that would need to be addressed. For example, NCDOT had already identified slopes that had eroded under roadways. “Our findings, and the findings of the whole GEER team, will almost certainly inform future research,” Montoya says. “But of equal importance was the opportunity for early-career researchers, like my grad students, to get firsthand experience collecting data under challenging conditions.